Murder and Mayhem at Old Bunbury, Clive Endive Ogive IV's eagerly awaited follow-up to his extremely successful and hugely influential Private Clubs in America and around the World, is another VERY clever and perceptive look into the special world of private clubs. 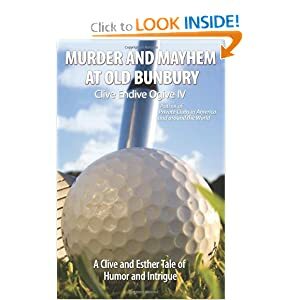 In Murder and Mayhem at Old Bunbury, President Clive and waitress-extraordinaire Esther team up to solve a gruesome murder at one of the world's truly great private clubs: the Old Bunbury Golf Links & Reading Club. Along the way Clive and Esther reacquaint you with many wacky old friends and introduce you to some even zanier new ones. Private clubs are inextricably woven into the very fabric of America's history, traditions and culture-and for that matter, those histories, traditions and cultures of ALL free societies around the world-and members, employees and guests alike (well, maybe not guests) will enjoy the author's penetrating insights, off-beat humor, blatant irreverence and sarcastic wit. EVERYONE with a sense of humor (club member or not) will laugh his socks off at this latest Clive tale. Clive Endive Ogive IV belongs to at least eighteen very exclusive private clubs-certainly all the ones that matter. The fact that he has a Roman numeral four after his name and is exclusive heir to a trust fund whose annual interest is sufficient to pay all his annual club dues in perpetuity-and also somehow manages to write all this money off on his taxes as "legitimate business deductions"-is more than enough to qualify him to author multiple groundbreaking and awe-inspiring books about the wonderful world of private clubs. For more information-and to order additional copies for your friends, enemies, fellow club members and fellow club employees-please visit Clive's website at www.CliveEndiveOgiveIV.com. This book provides readers with a fun look at private clubs and at the same time gives you the opportunity to engage with fun characters that stick with you from start to finish and beyond. Throughout the book you are given the chance to laugh many times and even say to yourself, did they just say that. Seeing that I have never been a member of a private club, from the outside looking in, you think that everything is glitter and lace, and though there is some of that in this book, I loved how the author pokes fun at this establishment and on top of this he throws in a murder just to make it more interesting. The book will keep you guessing (and don't ask me who did it, as I will not tell!). There were so many great characters that could have done it, as the author provides almost everyone a motive, the object is sigting through the clues to see who actually murdered Alfie Johnson. This was a great, but short book. If you like humor and mystery, this book was a quick read that was entertaining through and through!